For controlling coccidiosis in ruminating calves, cattle, sheep and young goats. Safe to use with ewes and lambs. 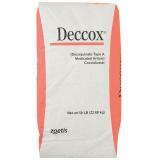 Mix a minimum of 1 lb of Deccox® into 1 ton of feed which provides 13.6mg of Deccox per pound of feed. Animals eating 3.3% of their bodyweight in daily intakes of the ration will consume the correct dosage of 0.5 mg per kilogram of bodyweight. If also offering hay separately to the lambs, this will reduce intakes of the ration and appropriate increases in Deccox concentration are needed to insure adequate intake of Deccox. Store below 77°, excursions permitted to 99° F and keep bag tightly sealed. 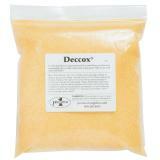 Mix 2# Deccox per 50# white salt and feed free choice for coccidia control. Mix 2# Deccox per ton of complete feed. There is no slaughter withdrawal for Deccox® but should not be fed to cows, sheep or goats producing milk for human consumption. Do not administer to animals intended for human consumption. An unapproved product may not indicate that is is unsafe or ineffective, but rather it has not been approved by the Food and Drug Administration for use in sheep. Due to the relatively few approved products for use in sheep, producers are frequently placed in a situation that requires extra label drug usage. In these situations we encourage you to work with your veterinarian and follow recommendations based on his/her advice. Questions? Ask a sheep expert for advice. The product works great! My only complaint is it needs to be offered in quantities for 50lb bags for us smaller homesteaders. This product is mixed 1lb per 2000lbs of food. Have used this product for years, works very well. Premier 1 was the only source I found that offered this medication in a smaller package. I was very pleased that it arrived promptly and in good condition. Just what we were looking for. We use this for the prevention of EPM in our horses. Shipped fast! Great product. Since I don't feed on a large scale it was a little difficult figuring out how much to use. But high quality and my goats are thriving on it.